All throughout the month of August there has been a really excellent blogathon happening over at Movierob and Ten Stars Or Less – a blogathon called Argumentative August, all about highlighting the fifty best courtroom drama films (according to GamesRadar). I chose to rewatch and review the classic To Kill A Mockingbird (1962). 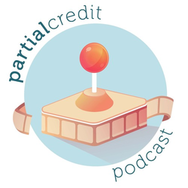 Be sure to check out the rest of the Argumentative August reviews here! I can’t put into words how much I love and adore To Kill A Mockingbird – both the book and the film. I have a close relationship with both as I grew up reading and re-reading the book from a young age, and watching the film semi-regularly as well. Even though the film is quite different to the book, with some timeline changes to make sure that the story flows nicely on screen, I firmly believe that this film is one of the better book-to-film adaptations out there. It truly retains the spirit and magic of the novel, and has exactly the same emotional impact by its conclusion. I love the characters most of all. And the best part is, all of the performances are top notch. Scout Finch, played to perfection by Mary Badham in her very first film, is a feisty young girl, a fighter who struggles with the concept of growing into a ‘lady’; all she wants is to continue being a tomboy and playing with her brother Jem (Phillip Alford) and their new neighbour Dill (John Megna). Learning about life under the guidance of her wise father Atticus (Gregory Peck), Scout’s passion and belief in what’s right and what’s wrong, and her developing learning about the points of her own moral compass, sets the tone for the film. Robert Duvall also stars as the reclusive Boo Radley – a mysterious and misunderstood figure. All of these characters are so memorable. When you watch this film, the characters’ authenticity shines through and you almost can’t dare to think that anyone else could embody these roles. 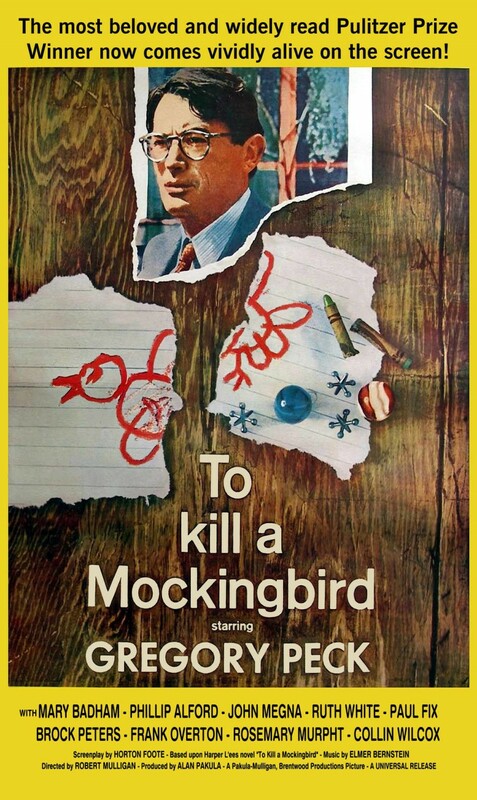 Particularly Gregory Peck as Atticus Finch – a role that literally no one else could ever play after his perfect interpretation of the character. Atticus Finch is one of my favourite literary and film characters (hence why I won’t be reading Harper Lee’s ‘new’ novel, Go Set A Watchman, where his character is significantly changed). His sense of equality and justice, and his focus on empathy for others, makes him one of those characters where you feel like you learn something from every line of his dialogue. 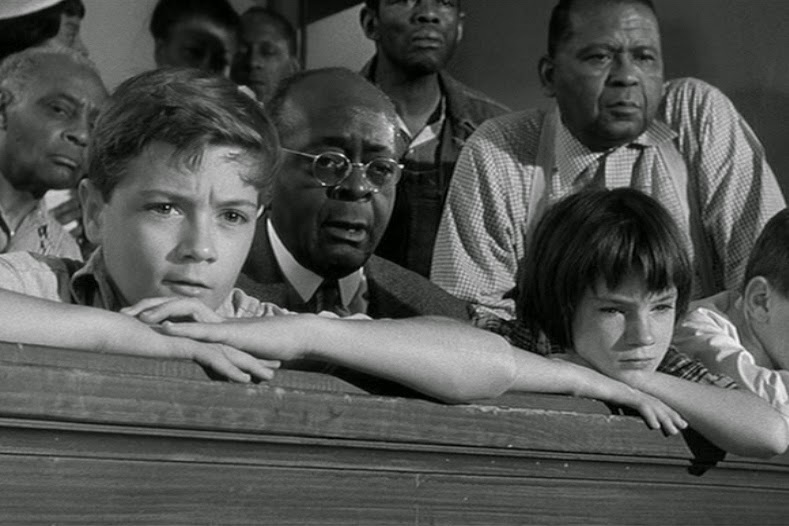 Atticus’ passionate legal defense of the accused Tom Robinson (played heartbreakingly by the wonderful Brock Peters) is in effect the main ‘action’ of the film; Scout and Jem (and Dill) watch the trial in the Maycomb courtrooms, watching Atticus as he tries to ensure that the bigotry of their small town does not condemn an innocent man to death. 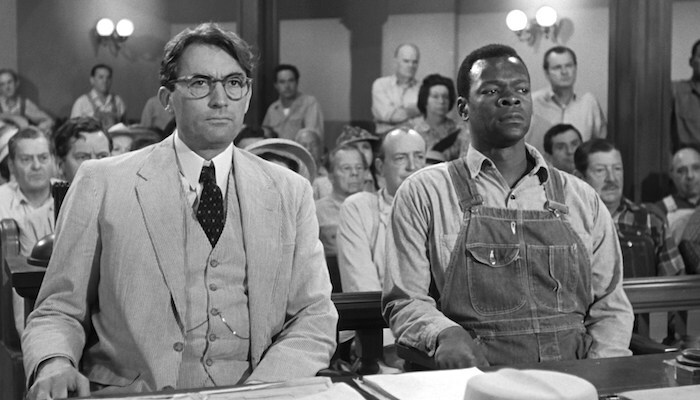 As aforementioned, Atticus’ legal defense of Tom Robinson could be considered the main ‘action’ of the film (and book), with the surrounding content detailing Scout’s childhood before and after the outcome of the trial. Scout’s perception of right and wrong, and of the people in her small town, is irreparably changed after the outcome of the trial also. The courtroom scenes are shot impeccably, with some wonderful and extremely well acted close up shots of the faces of Tom Robinson and his accuser, Mayella Violet Ewell (Collin Wilcox), as they are giving evidence. This is one of cinema’s best legal scenes as it brilliantly highlights the racism of a small town and the way that this has the potential to infiltrate the legal system, showing that in some cases, particularly in the South of the 1930s, there isn’t really liberty and justice for all. Aside from the story, the direction by Robert Mulligan is wonderful and brings to mind that feeling you may have had in your childhood during the summer holidays from school; so much time to fill with activities and adventures, so many opportunities for fun and to learn more about the world. The direction is simple and uncomplicated, which allows the story to unfold in an engaging manner without too much emotional steering. I love the way this film is shot, with some lovely cinematography by Russell Harlan also. I love the choice to shoot the film in black and white – an apt choice, given the content of the film. Not only is this a symbolic choice, but it also ensures that the characters stand out even more. To Kill A Mockingbird is a truly magical film, and an important one at that. By the end of the film you’ll want to hang on to these characters and know more about them. Scout is a young girl who you’ll want to see grow up, to see how this one time in her life shaped her beliefs and understandings of the world. You’ll come out of this film with a deep respect for one Atticus Finch, a man who stands up for the disenfranchised who have no one else to represent them. This is a story told with conviction, and is a story that needs to be told. Thanks so much Brittani! Yeah, I’m quite a bit skeptical of that book, so I think I will be avoiding it for the foreseeable future. Absolute nope! Wonderful review. Your closing paragraph completely nails it. My favorite favorite book on screen, lovingly scripted by Horton Foote. Magnificent. Thank you for this review! Thank you! 🙂 It is definitely scripted with a lot of love and respect. Beautiful film. Undoubtedly one of the best things I owe to my public high school education. 😉 Between watching this, Othello and the Claire Danes’ Romeo + Juliet, I really should thank the teachers I had for allowing me to see some great literary adaptations. They’re both great films in their own right, too. A rare quality, to be both a great adaptation and great in its own individual way.